Here’s an affordable chardonnay for all you oak haters out there. This chard is crisp, clean, has hints of citrus fruits and best of all — it’s cheap! I saw this wine recently at Costco and the label caught my eye. It looked like a Hedges Family Estate wine, but as I inspected the label all I could find was “Independent Producers” as the maker. The label also told me the grapes came from the famed Dionysus Vineyard and that the producers were against the 100-point wine-rating system (hence the 100 in the middle of a red circle with a line through it). A quick search on the Internet though confirms my original suspicions — Hedges Family Estates is behind this wine. I have come to love some of their affordable wines like their CMS red and white, so I was happy to try this one too. It’s a good chardonnay, and as I said, a great one for those who truly despise the over-oaked chardonnays that have plagued the industry. Mineral notes take the stage with this wine, lending it a brightness that would pair well with a lemon chicken or white fish in a light citrus sauce. It reminds me somewhat of a white Burgundy from France. For someone who often describes a wine she likes because, well it “just tastes good”, I can appreciate this rebellion against the 100-point system. Bottom line, if you like a wine it shouldn’t matter what rating it got, you’re the one buying and drinking it afterall. 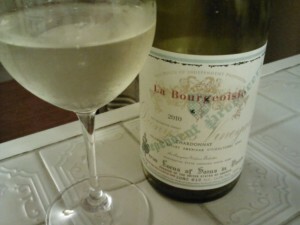 The 2010 La Bourgeoisie Chardonnay is available for under $15. This past weekend I went over to my mom’s house so she could get some quality time with her grandson, and so I could catch up with a childhood friend who came down from Bellingham to visit. She brought her adorable little ones with her — her son is a month younger than our little guy, so we wanted to get them together to “play”. My mom had read Ann Vogel’s recent column with the gumbo recipe and decided that’d be a perfect dinner to serve — plus it was easy, throw everything in the crock pot and play with the babies until it’s ready. I told her I’d bring the wine, but since I didn’t have time to run to the store and buy one of the New Zealand sauvignon blancs we recommended, I instead went to our wine rack. There I found a 2011 Hedges C.M.S. White. Why I like this wine: Because while sauvignon blanc is the dominant grape, it’s blended with chardonnay and marsanne (that’s what the C.M.S. means: Chardonnay, Marsanne and Sauvignon Blanc). So you still get the crisp, herbal sauvignon notes, but they’re rounded by the chardonnay and marsanne. A blended white wine with Sauvignon Blanc dominating over 75 percent of the wine, this was one of the original malic-acid friendly white wines released from Washington State. Rounding out the blend is a touch of chardonnay accompanied by just a pinch of Marsanne. Beautifully structured with wonderful Sauvignon Blanc fruit character, the mouth feel has a delicate balance of acid angularity and defined herbal sophistication. This wine paired great with the gumbo. It’s available at the grocery store — or Costco, which is where I bought it. It retails around $14.